Late 1967 and 1968 saw many artists move in a simpler, more pastoral direction (think Friends, John Wesley Harding, Sweetheart of the Rodeo). 50 years later, Paul Weller has also moved in this direction with True Meanings. Weller, who has just turned 60, has been prolific , with six albums in the last 10 years, including last year’s A Kind Revolution. All of these recent records have been well-received, with Weller’s willingness to experiment and innovate earning favor with the critics and the public. 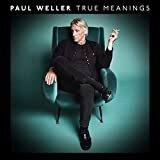 True Meanings may be something of a musical retreat to an acoustic, lightly orchestrated sound, but in the mayhem in 2018, this is no bad thing, especially when there are such gorgeous melodies among the fourteen tracks. All of the songs are well-crafted, but standouts include Aspects, Books and What Would He Say? This entry was posted on Tuesday, September 18th, 2018 at 5:58 pm	and is filed under General, General Music, Record Reviews. You can follow any responses to this entry through the RSS 2.0 feed. You can skip to the end and leave a response. Pinging is currently not allowed.